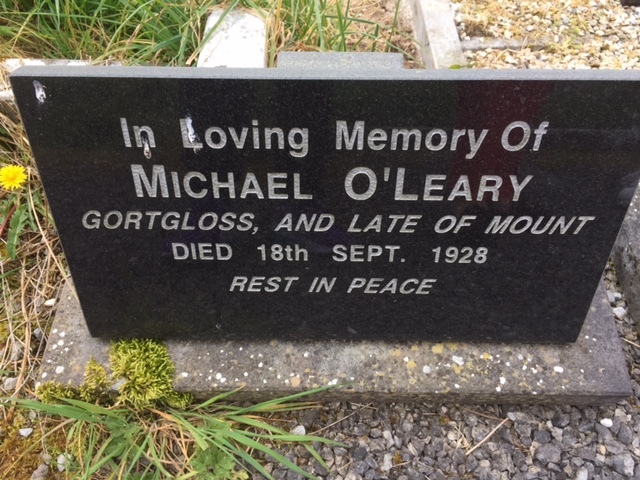 Michael B1853 D1928 rests in the O'Leary Plot at Kilsarcon Graveyard. 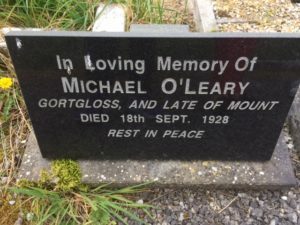 Michael O'Leary B1853 was the eldest of the O'Leary 11 siblings. Michael married Elizabeth Walsh Sullivan, Gortloss on 03/Nov/1879 at Castleisland Church - when Elizabeth's first husband Mr Sullivan died. She was nee Walsh. Jeremiah O'Leary and Edmond Walsh are recorded as the 'Father' of the groom and bride respectfully. Michael's grandfather Michael O'Leary and Cornelius (possibly Michael's Uncle) witnessed at the Wedding Ceremony. Michael and Elizabeth had one daughter Maggie B1881/82. Maggie married Cornelius Reidy (Glaundaeigh) from near Kilsarcon and they lived at Gortloss. Michael's first wife, Elizabeth Walsh O’Sullivan died and Michael married again. He married Dora Reidy. Dora's parents were John Reidy and Mary O'Connor. Cornelius Reidy and Michael's daughter Margaret Reidy moved into the Homestead dwelling. Michael and Dora moved to an adjacent dwelling close by. Living conditions were tough then. Dora was the Servant girl then and is recorded in that 1911 Census. Michael was 62 when he married Dora who was a-lot younger. Mai, married Con O'Donoghue Cordal. Lives at Castleisland today. Mai will be 100 years of age on St Patrick's Day in 2018 with the help of God. 5 Children. Sheila Mai - went to the UK. Michael's death cert is dated 29/Sept/1928 at age 60 incorrectly as he was actually aged 75 years. It is recorded that he died from Typhus Fever at the County Fever Hospital Tralee.